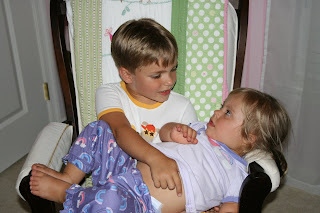 As much as Payton gets in her brother's way and frustrates him, he really does adore her. He likes to take on the parental role ... sometimes yelling at her, sometimes consoling her, sometimes taking care of her. I love that! The two sisters are going to have him wrapped around their little fingers! So sweet! Siblings are the best!